Notes: "Francis & Loutrel. 1876. Stationers, 45 Maiden Lane, New York. Unalterable safety checks, patented April, 1876. Patent, Safety tinit paper. Patent, spring back account books. Patent, spring back bank ledgers. Mann's celebrated parchment copying paper and books. William Mann, Philadelphia, manufacturers de libros en blanco. William Mann, blank book--Station..."--Display signs. Notes: Exhibit titles: Francis & Loutrel, New York, N.Y., Exhibit #1147b; Mann, Wm., Philadelphia, Pa., Exhibit #11557, Main Building, Bldg. #1. 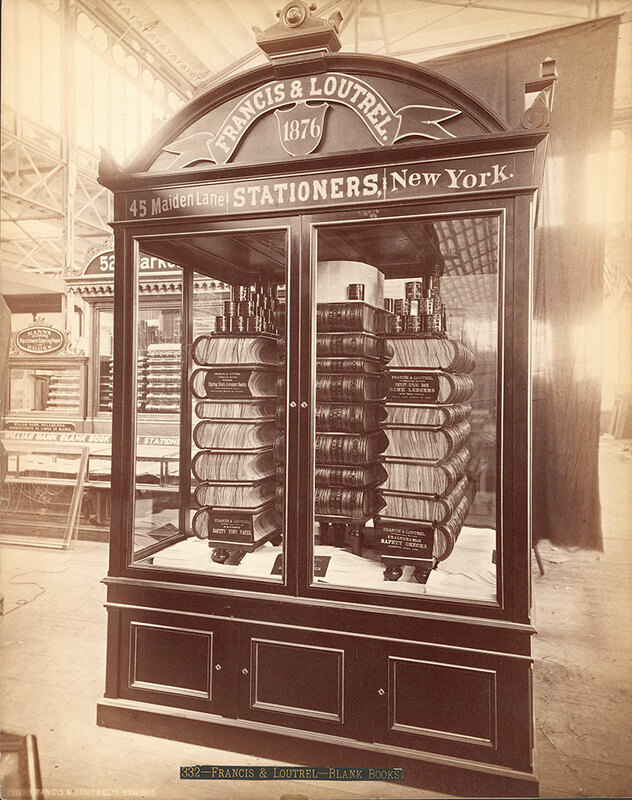 Notes: Typographical error in the Catalogue of the Centennial Photographic Co.'s Views of the International Exhibition; correct spelling is: Loutrel.